I stitched on Kyanite nearly all day. 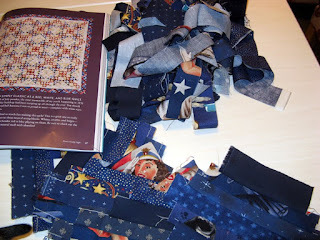 The sashing is going to take some time to finish. 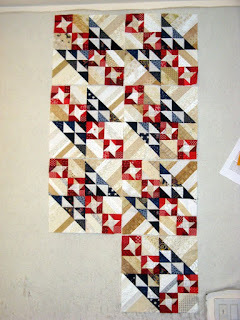 There were some string border units stitched as well, but the 2 1/2" pieced triangle in a square is going to be around for awhile. Last Saturday I stitched in Lakeside with some of the Sunshine Guild girls. 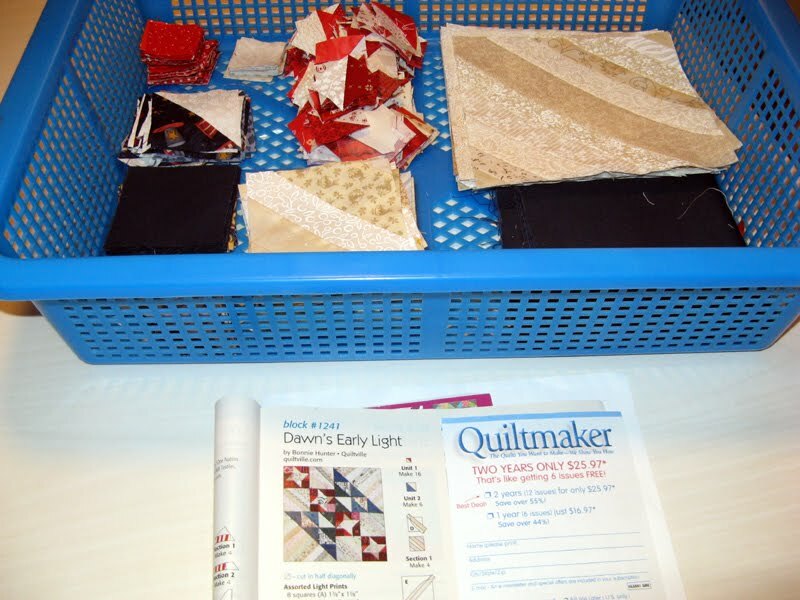 We discussed the wool parts of the next opportunity quilt and kitted the "X" blocks. We also have our first yo-yos completed. Members will be able to participate in the assembly of next year's project. 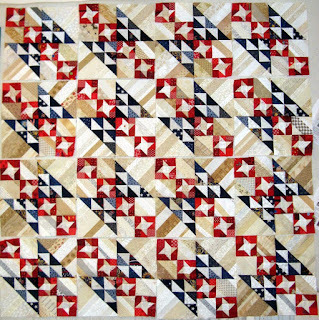 The current quilt will have a winner in June and tickets for this one will be available in September. I'll let everyone get back to waiting for the famous ball to drop in Time Square. This week there has been work on three projects. Kyanite is the only one that I have everything I need to stitch. I love how this one is coming out. That small unit in the lower right corner is part of the sashing. I need to make a whole bunch. I haven't calculated yet how many, but the quantity will be less than the project Straits of Mackinac from Bonnie Hunter's String Frenzy book. There are 50 done and another like amount part done. The original project calls for over 500 of these 2 1/2" units. 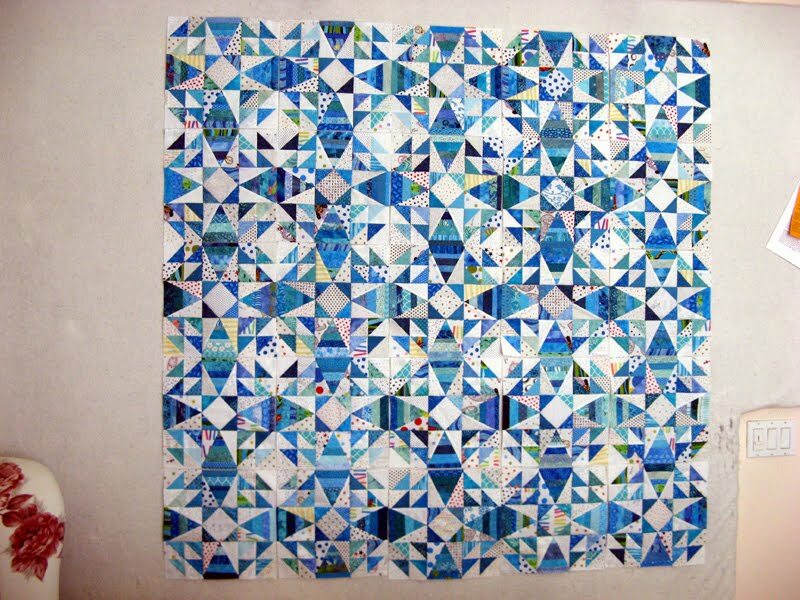 The solid aqua square is also part of the sashing. 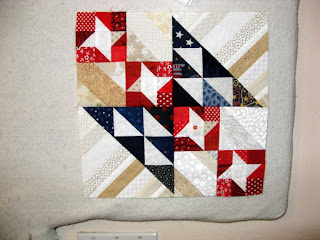 The last part of the project calls for a string border and a unit that finishes out the pattern. Even though this was on the 2018 UFO list...it should be a first to be done in 2019. Christmas gifts from Mom. Mom knows how I always need neutrals. As a matter of fact strips have already found their way into Part 6 of Koldplay (#GoodFortune). I can always use sharper flower pins too. Last purchase of 2018. FQ for Kilkenny Kat from Rosie's. 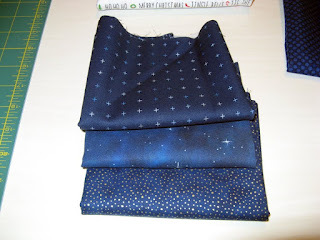 When I was at Rosie's getting FQs for Sunshine Quilt Guild's next opportunity quilt, this navy came home with me too. I didn't spend any time looking for more navys since Mom has a package coming my way with several pieces from her stash. 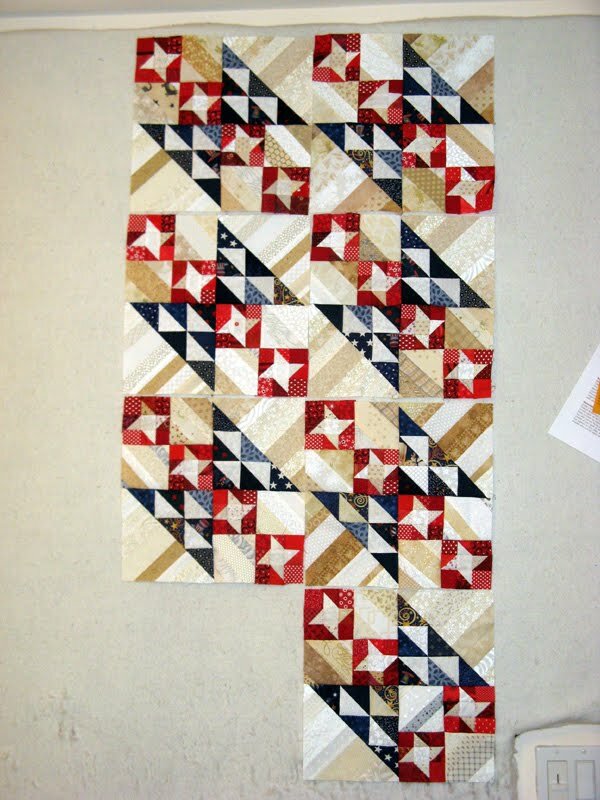 Kilkenny Kat's string border saw a little bit of stitching along with a few units stitched but not yet trimmed. These get cut in half once from corner to corner and a red strip joins the two pieces back together. 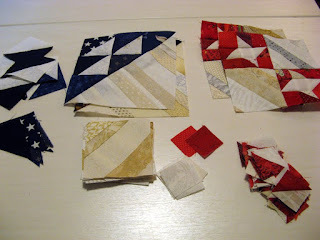 I am wondering if going scrappy on the red makes sense or too busy. The design wall will come in handy for that determination. 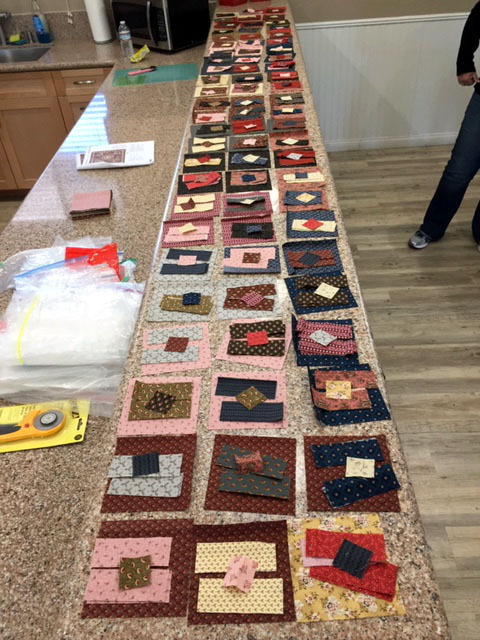 These fabrics for Sunshine Quilt Guild's next opportunity quilt were cut and kitted on Saturday. Invite will be extended to the members to help with it's making. There will be more on this project tomorrow. Tickets available September 2019. No final finishes for 2018. There are a lot from the 2018 UFO list to carry over into 2019 =^.^= For my last Stash Report of 2018 not so bad. It could have been better, but I still managed to move fabric out and not in! Part 5 of Koldplay is complete. Today I have had enough time to have each part released so far at half way. It is good to be where I want to be with the project. 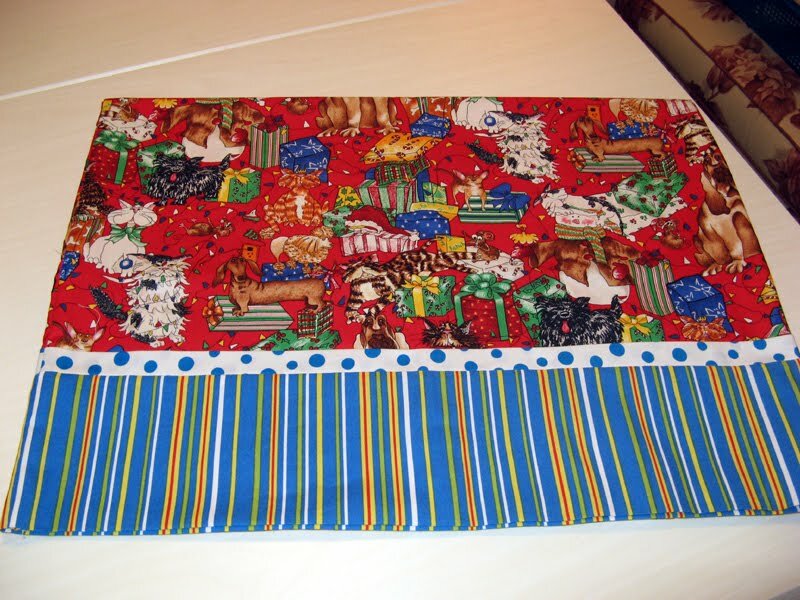 The holiday pillow case is done for Tim. Look close to see all the cats and dogs among the Christmas decorations. I was determined to use that stripe! This past week I did some shopping for Koldplay (#GoodFortune). 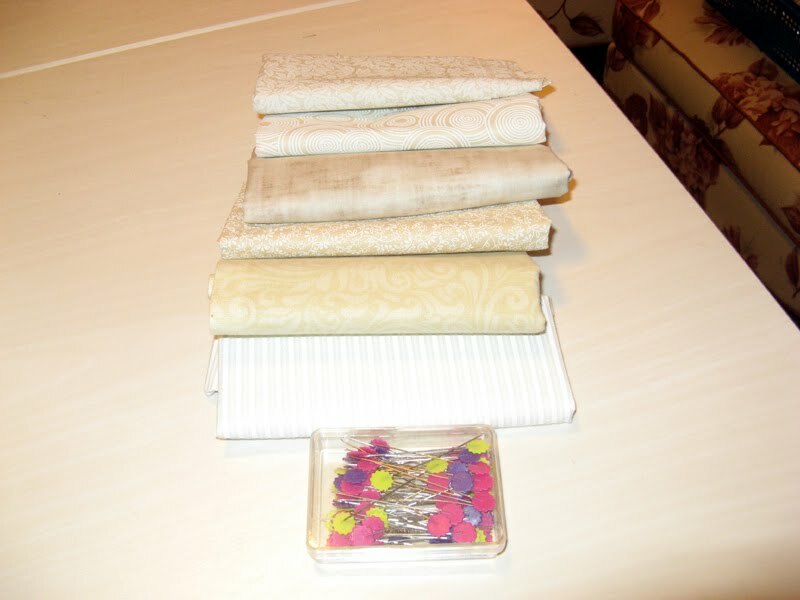 Paradise Sewing in Poway, CA, had a good deal when I stepped up to the register too! 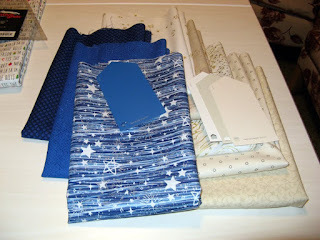 These blues and neutrals were needed for my project. 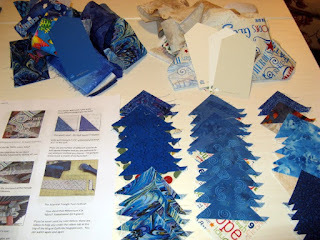 I picked up enough of the blues to enhance Kerry's project as well. Bonnie has released up to Part 5 to this point. 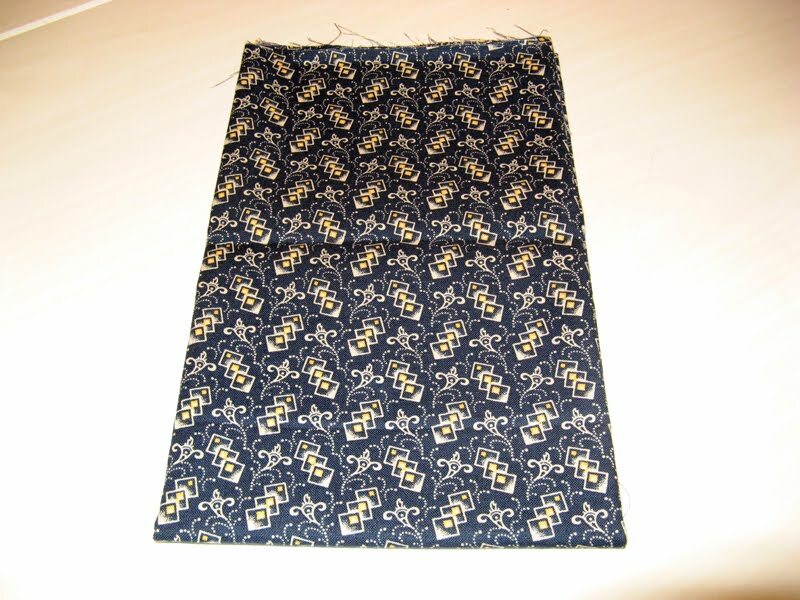 Navy blues were added to my cart too for Kilkenny Kat (Dawn's Early Light). 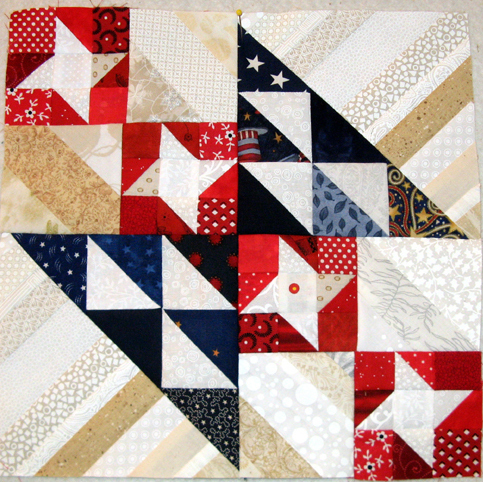 I'm going to be needing a bunch for the string border that is all blues with a single strip of red through the center of each unit. Mom has some to send me that I look forward to getting. I will be getting back to this project when Bonnie's mystery is done. These items which we won't talk about until a certain someone has opened her Christmas gift came home with me too. DH has already come up with a name for this one, Krackle. I will likely be shopping in the coming week, but for now this is what will be added to my 2018 purchases. One more week of 2018! You ready for 2019? This is Part 4 of Koldplay (#GoodFortune). 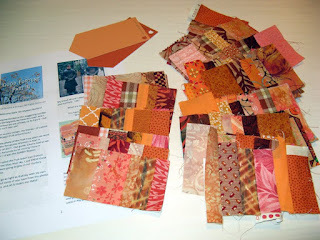 I have lots of oranges in the two shades Bonnie suggested. The units on the left are finished except for the paper removal. The units on the right are ready for trimming down to the 2 1/2 x 4 1/2 size. 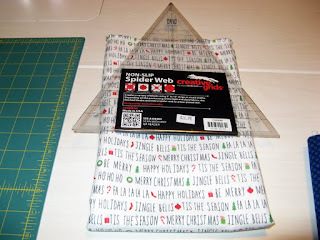 Today I will be working on a Christmas pillow case. 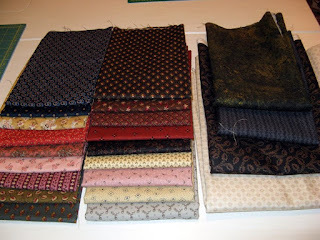 Once that project is finished there may be some time for sewing additional units of Parts 1, 2, 3 and 4. My goal is to make half the units required for the project. Then determine if I want the whole enchilada! This is all the blocks that I had planned to make for Kilkenny Kat (Dawn's Early Light) until I saw Bonnie Hunter's layout. 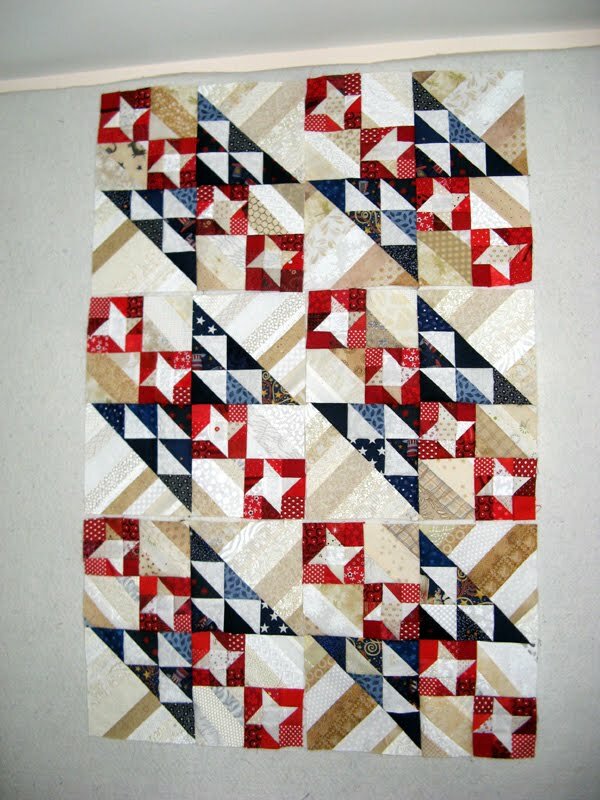 I just might have to make some more...or...try to make the border work for the sixteen blocks made. What you see above is for Koldplay. 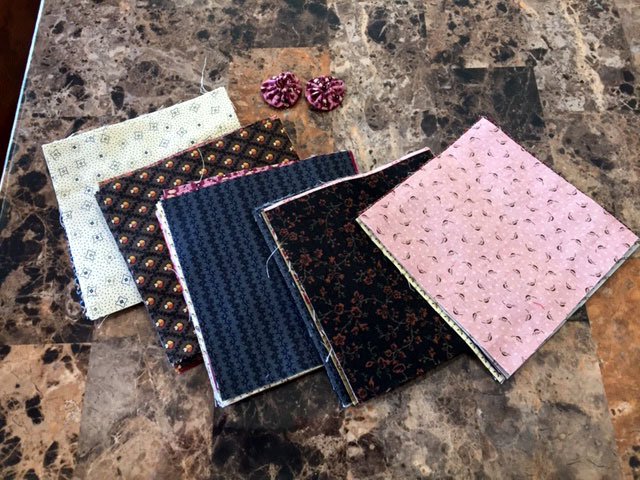 I picked the fabrics up at Paradise Sewing. Half of each of the four pieces will go to Kerry for her #GoodFortune. Not too many more reports in December...Enjoy your Sunday! Consider this a sneak peak at a pillow case. 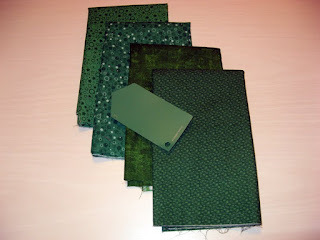 One of the greens for Koldplay will "play" well with the kennel fabric in red. I'll be working on this tomorrow. Part 3 of Koldplay (aka #Good Fortune) is finished in part :)! Don't you like the alligators that I have deemed a good neutral. I've had that piece of fabric for years. It has finally found a home! 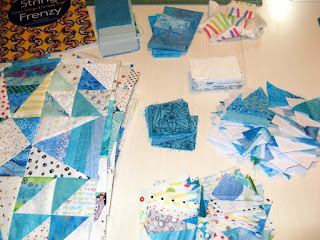 It would be so nice to have off today to finish the exciting projects I am working on. Oh well, the Holiday Break is just around the corner and this week is a short one. Enjoy your week! These are more pieces of the units needed to complete the project. 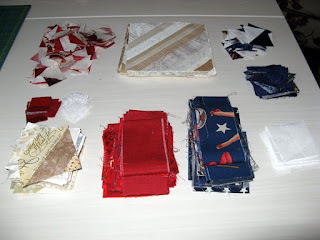 I rummaged through my scrap stash to find more red and blue for making more 1 1/2" red patches and blue portion of the HSTs. 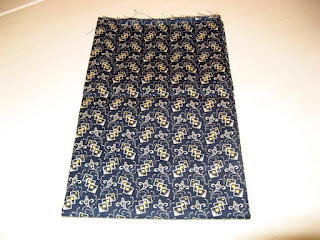 Today I will be spending time sewing on labels. Not sure you are a miserly as me, but I do my best to have four labels to print before I run the expensive silk label paper through my printer. 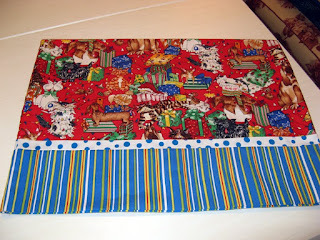 Kraft, Kapricorn, Kanton Kull and a self created blue ribbon with winning details for Kurry are to be sewn down. There is also a blank cover label for Kurry to be sewn down before it makes its way to Road to California. I pulled green scraps for Koldplay my Bonnie Hunter #Good Fortune. 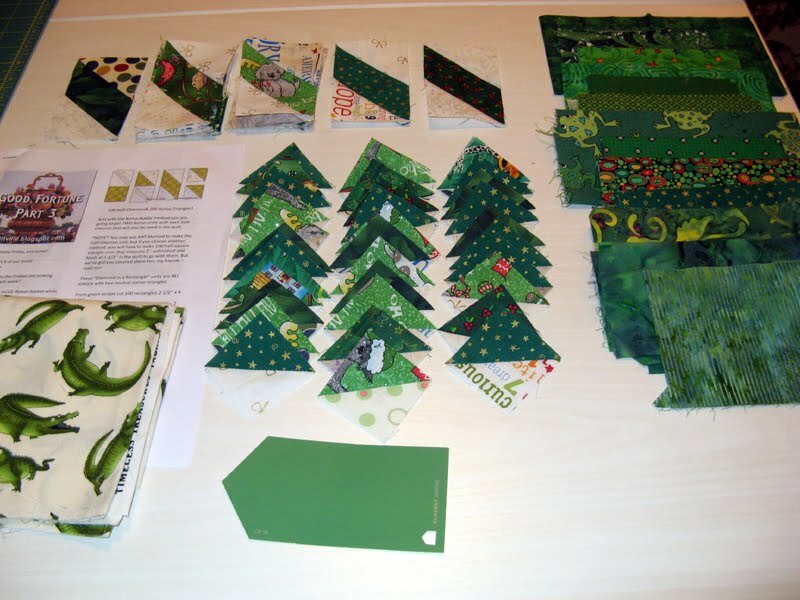 Green and neutral are in Part 3. More on my Part 3 tomorrow. Nothing changes my stash statistics this week. Not too many more in December...this might be all that will be used this year... Enjoy your Sunday! 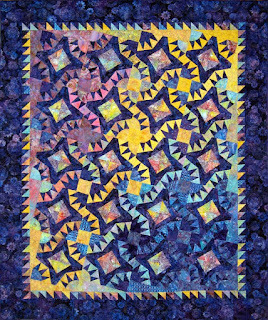 Dawn's Early Light by Bonnie Hunter at the start. This one is a 2018 UFO. 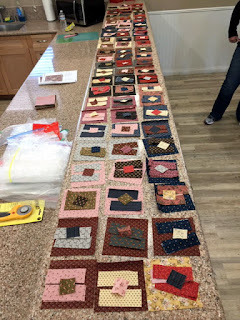 One block was sewn and much of the pieces cut; some in units as well. Anxious to put this one together. 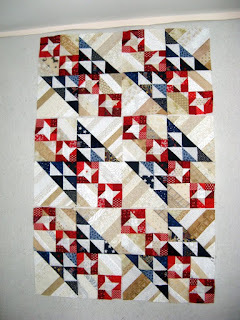 The neutral strip pieced blocks come from a swap I coordinated not too awful long ago. My friend Bonnie help remove some of the paper during lunch. 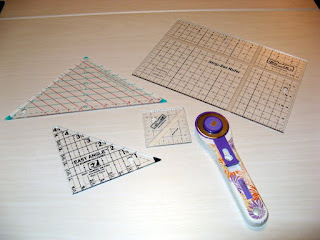 We also counted to learn how many more would be necessary for the 15 blocks that are planned for my project. I wonder if this will be one that Bonnie has a pieced border for in her new String Frenzy book. Anyone have the book yet and know the answer? 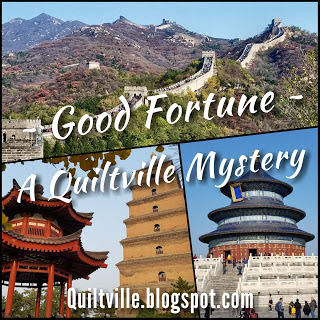 This one is Part 1 of #Good Fortune. 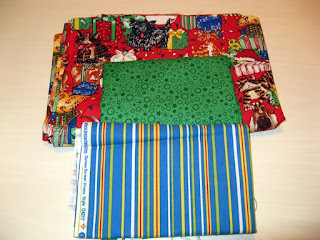 As you notice at the top of the photo I have fabrics for making many more of these 2" finished four patch units. The blue came in with Part 2 of #Good Fortune. 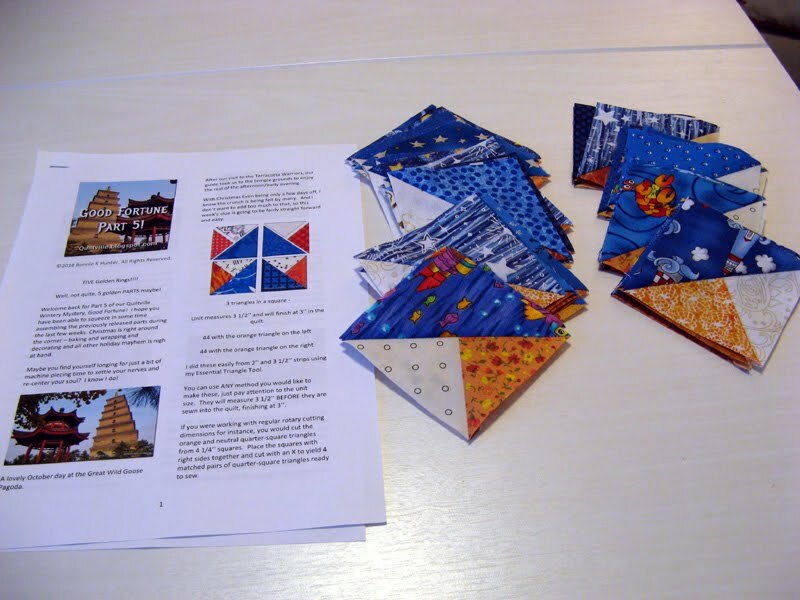 Lots of HSTs. And yes there is more to make and fabrics ready for cutting. 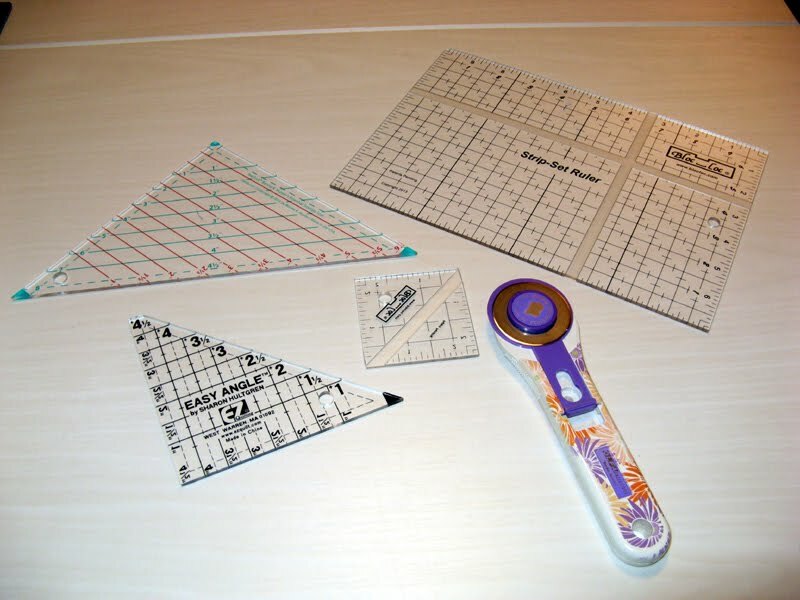 These are the tools of #Good Fortune that have been used so far. The two on the left perform the same task for cutting the HSTs. I am preferring the one on the bottom as it is easier for me to use. It is the shape that I like. Do you have both of them and which do you prefer? I received GOOD new about my Road to California Entry. Kurry was accepted into the 2019 Quilter's Showcase. I am abundantly excited! I will be getting it prepared for shipment as it must be with them by December 21st. I will share more with you about Kurry in the coming days. Wish me as much success as with the San Diego Quilt Show appearance where it took a Blue Ribbon. Kyanite awaits borders. 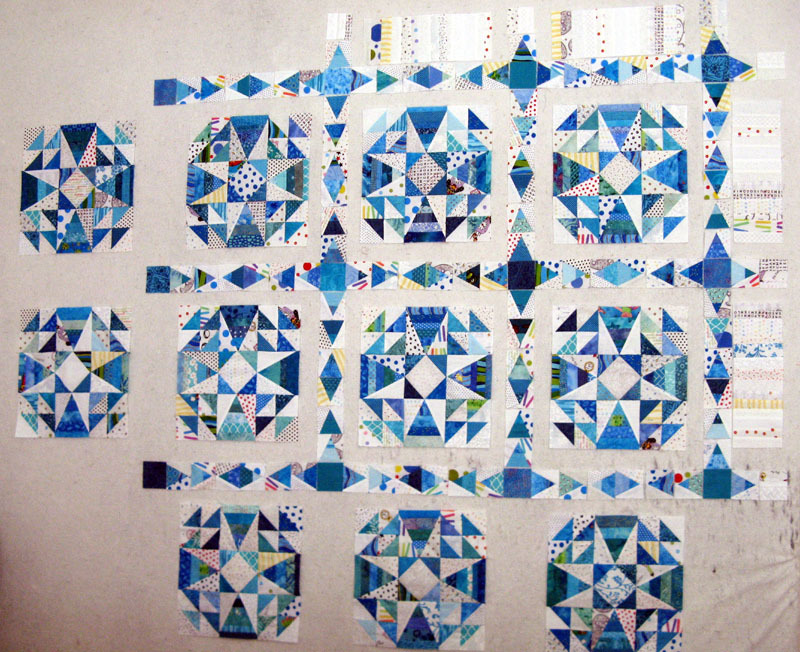 I finished all the blocks planned to make. The project Straits of Mackinac by Bonnie Hunter is much larger. 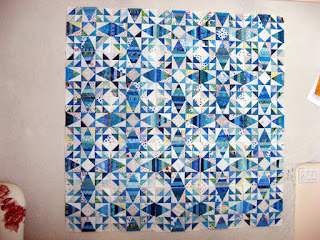 Mine will finish somewhere I suspect around 72" square. Once I have my hands on her new String Frenzy book the border will be made and attached. Until then it will wait in its project box. Thanks Faye for the name suggestion. 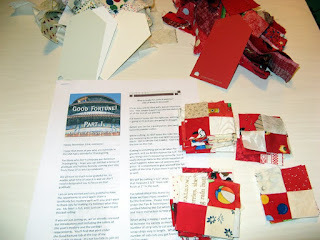 My focus for the next few weeks will be on Good Fortune with Dawn's Early Light filling in the sewing gaps. 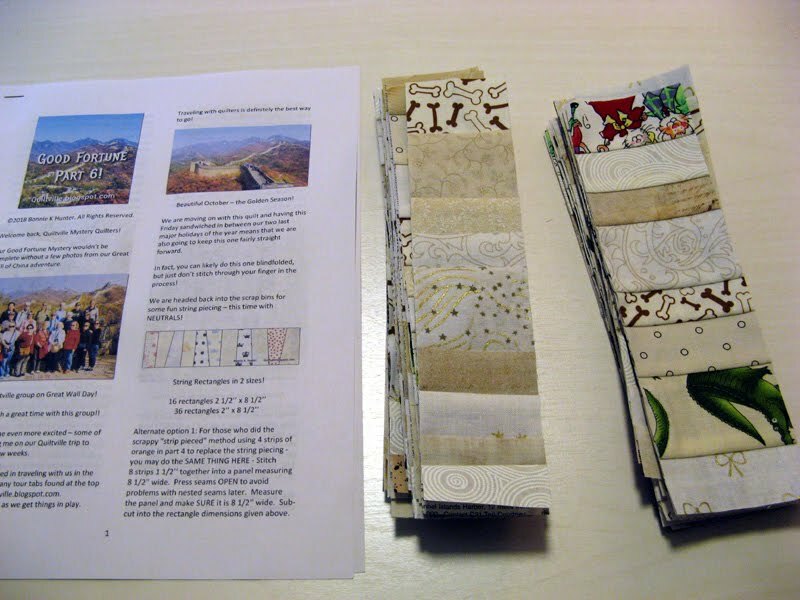 Both of these projects will be made about half the size that Bonnie Hunter enjoys making and bringing to us.